The Rev. Dr. John Sutherland Bonnell gained a national reputation as a preacher in his 26 years as pastor of the Fifth Avenue Presbyterian Church in New York City. Bonnell occupied the pulpit of the Manhattan church, sometimes called the “cathedral of Presbyterianism,” from 1935 to 1962. His Sunday sermons were regularly reported in the New York newpapers. And starting in 1943 he reached three million radio listeners with weekly talks on the ABC network. Rev. Dr. Bonnell died on February 26, 1992. Before his renowned ministry in NYC, Rev. 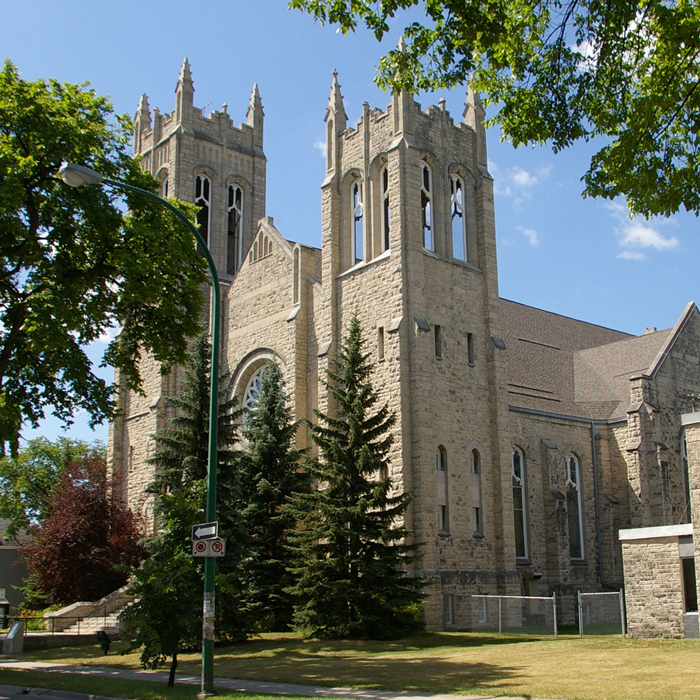 Dr. Bonnell had an exceptional ministry in Winnipeg from 1929 to 1935 at Westminster Church. What follows below is a short and engaging history of Bonnell’s remarkable ministry. At age 17, Bonnell began working at Falconwood (a psychiatric hospital) where his father worked as a Supervisor. A man, E.O. Brown—tried for embezzlement, found insane, and incarcerated in Falconwood—became the young Bonnell’s personal charge, whom he had to attend daily during exercise periods etc. They became friends, and Bonnell came to see that the man had a brilliant (not insane) mind and was well educated. At the time when Bonnell wanted to enter the ministry, matriculation from secondary school was not a prerequisite to entering college. However, he realized that the college entrance exams would require more of him than he had learned in school. As he set about educating himself, he recognized that Brown might be a valuable tutor for him. Their relationship thus took the form of student and tutor rather than minder and inmate. Bonnell asserted that Brown’s subsequent help enabled him to write and successfully pass the entrance exams and begin his education at Prince of Wales College. Graduating from Pine Hill in 1922, Bonnell’s first charge was on PEI where he served at New Glasgow Presbyterian Church. In 1923, he was called to St. Andrew’s Presbyterian Church in St. John, New Brunswick, and in 1927 he completed his Bachelor of Divinity Degree and was given a one year leave of absence from St. Andrew’s in order to take post-graduate studies in London, England. During that time he travelled extensively on the continent. This was probably when he first visited Russia, becoming familiar with the Bolsheviks’ campaign to turn the country away from religion. He later returned to this issue in 1934 when he again toured Europe with Rev. Sherwood Eddy. (He would eventually preach sermons at both Westminster Church in Winnipeg and at Fifth Avenue Presbyterian in New York about the experience. In his New York sermons, he warned Americans about the possibility of Communists infiltrating American institutions and attempting to foster atheism in the U.S. These sermons were regularly reported in the New York papers each week.) It seems that Bonnell was adding his voice to others in developing America’s paranoia concerning Communism—paranoia later resulting in the McCarthy Hearings in the 1950s. Ironically, Bonnell’s name was on a list of suspects of one of McCarthy’s aides. When Bonnell and two other leaders of The National Conference of Christians and Jews found that McCarthy was targeting them, they sent a public telegram to President Eisenhower protesting accusations that Protestant clergymen in the U.S. were a major source of supporters for “the Communist apparatus”. Eisenhower replied in support for the clergy. His statement marked a turn from indulgence to opposition in the Eisenhower administration’s attitude towards the hearings. In 1928 when he returned from his studies in England to St. John, New Brunswick and before leaving for Winnipeg, Bonnell was given a public commendation by the city for his preaching and for his contribution to St John. In 1929, he received his call to Westminster Church and was inducted into the pastorate in October of that year. Prepared for Westminster Church by R.E. Halstead. Rumors abounded that he packed Westminster on Sunday mornings to the point that the overflow had to be accommodated at the Tivoli Theater across the street. The truth is that Bonnell’s services were so well attended, the sanctuary couldn’t contain the crowds. (Sanctuary seating at that time was approximately 1100). The overflow had to be accommodated in the main floor Lecture Hall and the Sunday School meeting area on the second floor where the audio of the service was “piped” in on speakers. The Tivoli overflow that people speak of probably happened only on two occasions where Westminster was the site for large gatherings of the general public ( admission 50cents.). As mentioned earlier, Bonnell was committed to the idea of how religion impacts on the human condition. Beyond his Sunday sermon topics, his mid-week talks with the ‘Young Men’s Club’ at Westminster emphasized politics, peace, poverty and other social concerns. For many of the ills of the human social condition Bonnell was convinced that religious faith was the only sure remedy. In 1960, while in the U.S., Bonnell urged churches generally, to speak out on social and economic issues as well as on salvation. Consequently, when Dr. Sherwood Eddy* “One of The greatest social prophets of our day” became available as a speaker, the Winnipeg Y.M.C.A. and the Westminster Young Men’s Club organized a mass meeting for men on November 19, 1933 in the afternoon. Eddy’s topic was “The Challenge of Russia”. Admission was 50 cent in the Sanctuary; 35 cents in the Tivoli Theatre across the street. A second meeting was held that evening for both men and women. Eddy may have been the speaker, but, Bonnell was surely the moving spirit behind the event. Bonnell’s sermons at Westminster often reflected his concern for social order. For example: “The Suicide of The Social Order:-The Reign of God Is The Only Hope of The World”; ”Is Morality Breaking Down?”- a rebuttal to Bertrand Russell, Ernest Hemmingway and others for their approval to throw all morals overboard; ”Unemployment, A deepening tragedy” and “the Human Factor in Unemployment”. And, not surprisingly: “Youth and The Liquor Question” and “Adults and The Liquor Question”. On June 19, 1932, Bonnell preached on the topic “What Is Your Master Passion?” In the sermon he analyzed the motives that operate in men’s lives. He then set forth a challenge calling men and women to dedicate their lives to a ‘Passion for human betterment’. Also in 1932 Bonnell spoke to The Young Women’s Club on the topic “Is the General Influence of Moving Pictures Detrimental?” In 1929, Disney had produced Steamboat Willie featuring Mickey Mouse. It was the first cartoon to feature a fully post-produced soundtrack. “Talkies” were an exciting new part of the movie scene. Bonnell’s remarks on the subject were not recorded, but his interest in this aspect of popular culture is evident by the title of his lecture. In September and October 1934, Bonnell gave two public lectures (admission 50 cents). The September lecture was “Russia As I Saw It” and the October lecture was “Adolph Hitler and The German Revolution”. Bonnell was a voice respected and his thoughts well worth the price of admission. Bonnell’s father was Supervisor in a hospital for the mentally ill. Bonnell’s experience with patient/mentor E.O. Brown, his general exposure to the problems of people with mental illness, and the relatively new science of psychology made a lasting impact on him and his work in pastoral care. During his career as a minister/pastor Bonnell developed a blend of psychological and spiritual guidance about which he wrote several books, encouraging other ministers to employ the knowledge and skills of psychology in their pastoral work. Another theme that ran through his sermons and talks had to do with Protestantism, the meaning of the word, the need for a union of protestant denominations and the root of his differences with Rome. On the meaning of the word Protestant, Bonnell notes ” Most people think that it means merely an Objector, one who is opposing beliefs or policies. That idea is, of course, quite wrong. A protestant, as the use of the word in Reformation times reveals, means one who makes a protestation….”a solemn declaration of fact opinion or resolution.” He goes on to say that in the Old testament, the prophets of Israel were the Protestants of the Hebrew faith. On Christmas day, 1931, Pope Pius XI issued his encyclical Lux Veritatus ,The Light ofTruth (on the question of reunion between Roman, Eastern Orthodox and Protestant faiths). The Pope invited them to make their submission to him on two grounds: first, the Immaculate Conception of The Virgin Mary and, secondly, the dogma of Papal Infallibility. For Bonnell, submission to such ideas was anathema. Bonnell believed, as did St. Paul, in Jesus as the Chief Cornerstone of the Church. No union with Rome for Bonnell. During his time at Westminster Church, Bonnell preached on the Oxford Movement—a movement in the Anglican Church. He also invited speakers from that movement to his pulpit (for example KenistanTwichell). Bonnell also broadcast weekly from Radio station CKY on Wednesdays at 5:45. From that, the station received letters of praise from listeners in the Canadian West and the United States. The Westminster congregation was invited to donate to a Radio Fund to defray costs of the broadcast. In April/35 the Canadian Radio Commission “in recognizing the honor that has come Dr. Bonnell in being invited to an international pulpit” gave him the opportunity to make a coast to coast broadcast. On May 1, Bonnell made his final broadcast on CKY. On May 26, he preached his final sermon as minister of Westminster Church. Even in the 1950s, Bonnell’s name still invoked a kind of awe. In part, this awe was inspired by his leaving here not only for New York but also for a call to a prominent church, Fifth Avenue Presbyterian, as well. There appeared to be good reason for his continued stature at Westminster Church. In fact Bonnell was a man driven by ideas; specifically he was interested not just in religion per sé, but rather more broadly in how religion impacted on the human condition. He was a wonderful story teller, a keen observer of politics, a witness to the destructive impact of poverty on people. The period was of course mid-Depression. He was an evangelical preacher but also a moderate one. He became a confidante and advisor to Billy Graham, but never considered himself a fundamentalist. Bonnell was well known through the several books he wrote (basically directed at fellow ministers), in which he expounded on the ideas he had developed on the marriage of spirit and psychology, encouraging other ministers to employ his techniques in their pastoral work. Some of these books are still available online for purchase. Among the many influences during his time in New York City was Toyohiko Kagawa, a Japanese evangelist and social activist who had spent time in the U.S. studying at Princeton Seminary and travelling about the U.S. and Canada delivering his message of The Kingdom of God. In 1931, while at Westminster Church, Bonnell visited New York and spent an hour in private discussion with the famous Christian speaker. This meeting resulted in two sermons while at Westminster. One of those sermons—“Kagawa’s Challenge to Canada”—contained a challenge to Westminster Church to lead Winnipeg in establishing the spiritual and economic aspects of the evangelist’s Kingdom. During Bonnell’s time at Fifth Avenue Presbyterian, his reputation led to his involvement in and often leadership of a number of well-regarded professional groups such as the National Conference of Christians and Jews. He spoke widely in the United States, for example to ministerial conferences. In 1966 he came out of retirement to serve for three years as the president of New York Theological Seminary. In February 1992, his death was announced at his home in Roseburg, Oregon. He was 99 years old. **(2)“In an article in Look magazine (March 23, 1954) Bonnell had stated that he and most other Presbyterian ministers did not believe in the virgin birth or bodily resurrection of Christ, the inspiration of Scripture, a real heaven and hell, etc. This unbelieving wolf in sheep’s clothing said that he and most other Presbyterians “do not conceive of heaven as a place with gates of pearl and streets of gold. Nor do they think of hell as a place where the souls of condemned are punished in fire and brimstone.” Author unknown. ***Kagawa, as part of his North American tour, visited Toronto, Guelph, and several other cities in Ontario. He also toured Nova Scotia in 1936, where his ideas regarding the establishment of cooperatives took root. (See Kagawa’s book, Brotherhood Economics.) The internet abounds with articles on Kagawa and his life and ministry.